Objective: Avoid being caught in or between objects. Review the reasons why caught-in and caught-between accidents happen. Discuss the typical caught-in or caught-between incidents presented. Have workers discuss why the accidents in the scenarios occurred and how they could be prevented. Green industry workplaces are full of heavy objects that can move—vehicles, equipment, and machinery. Many of those objects also have moving parts. Objects that are raised off the ground can fall. When one of those objects moves unexpectedly or falls, it can land on a worker. The worker can be caught between the object and the ground or another object. Workers standing within the swing radius of some types of equipment can be struck. A worker can also be caught in moving machinery parts. Caught-in or caught-between accidents can occur between a power-take-off (PTO) and the shielding, as shown here. Other hazards include pinch points, cut points, and crush points. For more information, see the Tailgate Safety Training module Protecting Hands and Fingers. OSHA considers trenching and excavation hazards as caught in-between hazards, these are addressed in a separate Tailgate Safety Training module, Trenching and Excavation Safety for Trainers and Supervisors. Equipment can move when not properly immobilized, causing a hazard. For more information on immobilizing equipment to be worked on, consult another Tailgate Safety Training module, Chock and Block for Trainers and Supervisors. Working under mental or physical stress. Lack of training or instructions. Here are some typical accidents, along with safe practices that could prevent them. While hauling sod, a worker stopped to change a flat truck tire. The truck fell off the jack, pinning the worker between the ground and the truck. Two workers were working on a stationary conveyor when it fell off its stands. The workers were caught under the equipment. Never work under a vehicle or equipment that is supported only by a jack or a stand. The jack or stand could tip, and the raised equipment then will be dropped on the person under it. For more details, refer to the Tailgate Safety Training module Safe Use of Jacks. A worker removed the shields on the PTO for repairs but failed to replace them after service. Another worker got caught in the PTO. After servicing, all PTO shields must be replaced. Only snug-fitting clothing should be worn when working around a PTO. This will prevent clothing from being caught in the PTO. For more information, refer to the Tailgate Safety Training modules Safe Use of the Power-Take-Off (PTO) and Power-Take-Off (PTO) Shielding. A nursery worker unhitched a wagon without chocking the wheels and was run over when the wagon rolled forward. A worker forgot to chock the equipment trailer when unloading a mower and was caught between the trailer and the building. While unloading or working on equipment, the wheels of equipment need to be pinned to hold them stationary. This procedure is called chocking. 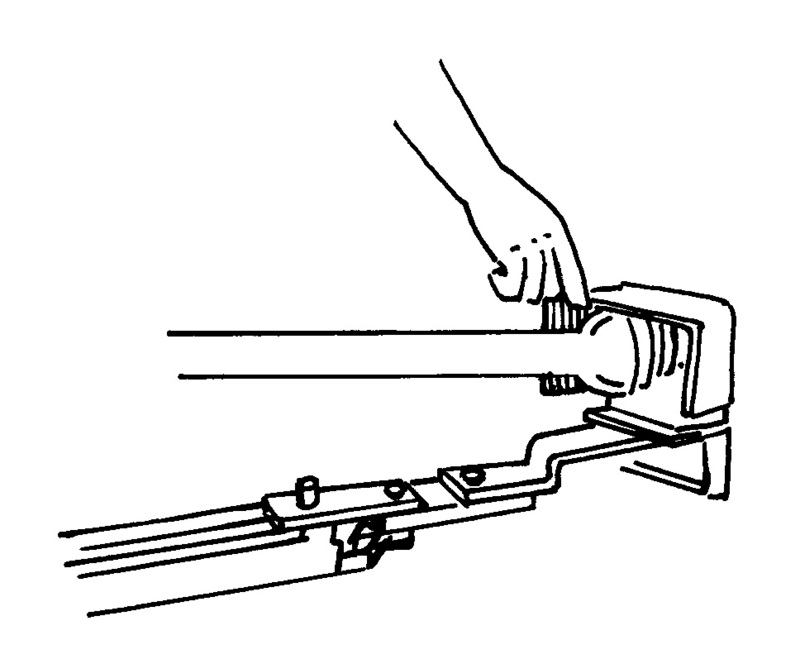 By chocking the wheels, the equipment will be unable to roll and cause injury. For more details, refer to the Tailgate Safety Training module Chock and Block. While backing a loaded equipment trailer to a truck, a worker was caught between the truck and the trailer. When helping someone to hitch equipment or an implement to a truck or tractor, stand to the side. That way, the driver can see you. Also, you won’t be between the truck and the equipment. Always chock a vehicle before doing any work on it. Always chock towed equipment before unhitching it. Use caution when working with moving equipment. Replace shields immediately after service or repairs. Never work on raised equipment on a stand—always block it first.